Spread a little sunshine with this top quality Italian tapenade. 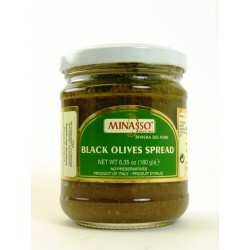 Ingredients: Black olives, olive oil, salt. The rich, salty earthiness of this fine black olive tapenade is the perfect complement for pasta, spread on crostini or bruschetta. Try some on a baked potato.